Rabushka's Concerto Vocale is stylistically akin to his exciting Concerto for Harp and Chamber Orchestra (VMM 3032). In particular, the wonderfully satisfying writing for the flute in this piece clearly came from the same pen as the earlier concerto. The ensemble is similar also, mainly a string orchestra with which the soloists contrast clearly. The flute solo here is extended enough that it might have found its way into the title. However, the work is meant to be primarily a setting of Psalm 126, in Aramaic, sung by soprano. The soloist is exceptional, with a strong, clear voice, perfect breathing control and no affectations. The vocal range is relatively low for a soprano. The text is presented without repetition, with instrumental passages between verses. Following the phrase "we were rejoicing" Rabushka surprises us with a polka. This is not your beer garden variety polka, though, and its rhythms are very appealing. This concerto is going to be a permanent part of my listening repertoire. To take the other vocal work here out of turn, Meier's missa brevis is for me also a real find, and the most refreshing work I have come across in this form since Britten's Missa Brevis. (Since I don't make a point of seeking these out, I may of course be overlooking a great deal, but I expect that this work will bear a lot of repetition also.) The small mixed choir is excellent. The musical treatment ranges from monodic to polyphonic; there are antiphonal passages, most notably when high and low voices alternate in the Christe eleison section. The mood of the music ranges from peaceful to exuberant, but not solemn except perhaps in the Benedictus. Angst is completely lacking. Tsippi Fleischer's train symphony begins with realistic effects of chugging and whistle blowing before continuing, through six short movements adding up to about ten minutes, with purported expressions of love, cruelty, depression and the "monotonous vector of the mind," none of which I can hear in the music, which is, however, varied and interesting musically. Grossner's Destiny is a seven and a half minute work in four sections. Extra-musically, the composer suggests the possibility of creating one's own destiny. Musically the music ranges from growly bass to quiet high strings, with percussion and brass standing out also. Myers' Toccata-Fantasy, composed originally for piano in 1987 and orchestrated between 1998 and 2000, carries no heavy baggage. In a short 6:22 it offers a wide range of effects: tinkly percussion, brass that is brash, then perky, quiet string writing, an oboe solo with percussion accompaniment. The piano has not been entirely written out, either. In sum, there is a wide range of expression on this disc. 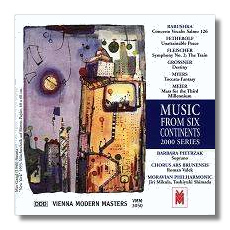 Despite the "six continents" in the series title, four of these composers are from the US, one from the UK (Grossner) and one from Israel (Fleischer). All in all, a very interesting release.